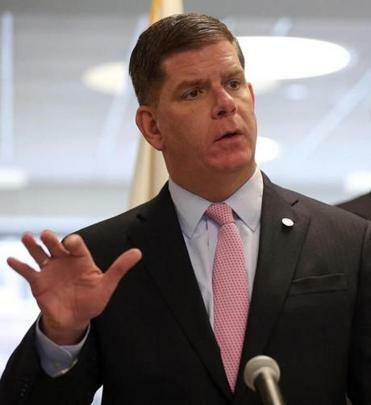 Angling to be in the vanguard of the fight against economic inequality, Mayor Martin J. Walsh of Boston joined a growing chorus of political figures who support a $15-per-hour minimum wage. Walsh, a Democrat, said Monday he supports raising the Massachusetts minimum wage — currently at $10 per hour — to $15 per hour over a period of years, the same day the governors of California and New York signed such graduated wage hikes into law. “When you look at the disparities, and income inequality, and what’s happening, I think it’s important for us to work on the issue. And the way we work on the issue is by increasing the minimum wage over a period of time,” Walsh told the Globe. Unions applauded Walsh’s position, but it immediately drew reproach from business groups. And the mayor’s stance appears to be at odds with key Beacon Hill leaders. House Speaker Robert A. DeLeo said Monday it is “premature” to discuss further raising the state’s wage floor, less than two years after a substantial increase was signed into law by then-governor Deval Patrick. But Senate President Stanley C. Rosenberg, seen as the most liberal of the Beacon Hill leaders, indicated he may be open to another boost. “It’s under active discussion in the Senate at this point,” said Rosenberg. Pressed on whether he personally supports a $15 per hour statewide minimum wage, he did not directly answer the question. Massachusetts’ minimum wage rose to $10 per hour at the beginning of the year, and state law mandates that it increase to $11 per hour at the beginning of 2017. It’s part of the three-step minimum wage hike that Patrick signed into law in June 2014, when Massachusetts was on course to have the highest minimum wage of any state in the country. Today, Massachusetts and California are the only states with a $10 hourly minimum wage, according to the National Conference of State Legislatures. And, he said, given the profound gap in wages between the comfortable and struggling across Boston and Massachusetts, a $15 hourly minimum wage is the right move. Chris Geehern, executive vice president at the Associated Industries of Massachusetts, which represents employers, said Boston is a different economic environment than the rest of the state. Jon Hurst, president of the Retailers Association of Massachusetts, said calls to boost the hourly wage floor to $15 “are premature and would result in unintended costs and consequences for small businesses.” He said an increase of that magnitude would have an outsize negative impact on retail stores, and would reduce the availability of jobs for youth. Harris Gruman, Massachusetts political director for the Service Employees International Union, said Walsh’s position is “great news” and his union could not agree more with the stance of Walsh, a onetime union official. Gruman said Massachusetts would be the fourth richest nation in the world per capita if it were its own country, and suffers from terrible income inequality. “To rebuild shared prosperity, we need a $15 minimum wage,” he said. Gruman is also one of the leaders of a coalition group that worked to put a question raising the minimum wage on the 2014 ballot, but pulled it after the Legislature moved its own wage hike legislation. He did not answer a subsequent e-mail Monday evening asking if that coalition, Raise Up Massachusetts, might work to put a $15-per-hour minimum wage question on the ballot in 2018. That’s the year voters could decide on a constitutional amendment to raise taxes on the very rich, and when Baker, a Republican, will be up for reelection. California’s law, signed Monday by Democratic Governor Jerry Brown , increases the Golden State’s hourly wage floor for many businesses from $10 to $10.50 per hour on January 1 of next year, then boosts it each subsequent year until it reaches $15 in 2022. After that, the minimum wage could be increased for inflation. New York’s law, signed by Democratic Governor Andrew Cuomo, boosts the New York City wage floor to $15 by the end of 2018, and 2019 for very small businesses. In some areas surrounding New York City, the minimum wage rises to $15 by the end of 2021. And in upstate New York, the minimum is lifted to $12.50 an hour by the end of 2020 — after which, it will rise to $15 on a timeframe to be developed.